Take a trip to a frozen winter wilderness in Wolf Ridge. This 5 reel, 30 payline video slot has been created by IGT and comes with a special rotating Prize Disk above the main reels which can deliver cash prizes and free spins. Those free spins are played using an enhanced paytable. You can also double and treble prizes there too. Play on your PC, tablet or mobile device from between 50p and £1,000 per spin. The design in Wolf Ridge is pretty good. The action takes place against a wintry backdrop where you’ll see snow-capped mountains and the Northern Lights. Joining the 5 lower value jewel symbols are raccoons, big cats and mountain goats. The most lucrative symbol is the wolf. Land 3, 4 or 5 of these on a payline and you’ll receive a payout of 0.5, 1.5 or 10 times your total bet. Look out too for the wild that can hit on reels 2, 3 and 4 only. Central to the action in Wolf Ridge is the Prize Disk feature – this is a selection of cash prizes and free spin triggers which appear above the reels. The Prize Disk shifts 1 reel to the left with each spin. If you land a scatter on reels 1, 3 or 5 during the base game, you’ll win the prize directly above it. This can be anything from 2 to 70 times your total bet. If the scatter hits on reel 3 during the base game, the award on offer from the Prize Disk is trebled. Each scatter that lands directly under a Free Spins logo on the prize deck awards 10 free spins in the Free Spins Bonus feature. The prizes on offer increase in the free spins with the payouts from the animal symbols doubling. The Prize Disk feature can really come into its own here as scatter can land on all 5 reels during the feature rather than just the odd numbered reels. The 3x multiplier for a Prize Disk win remains in place here. Land a Prize Disk win from reels 2 or 4 and the payout gets a 2x multiplier boost and is doubled. Land a scatter under the Extra Spin symbol on the Prize Deck and 2 more free spins are added to your tally – there’s a whopping 250 free spins up for grabs! 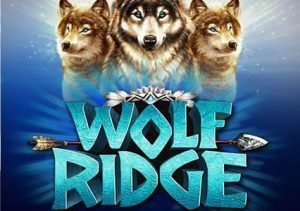 IGT haven’t been one of our favourite developers but Wolf Ridge won us round. The visuals are well done and the wolf howls and Native American backing track create a good atmosphere. The Prize Disk delivers enough action to keep things interesting, especially when you trigger the Free Spins Bonus feature. The variance is in the medium round which offers a balanced range of payouts – the top prize is 1,000 times your bet per spin. This winter wonderland proved more enjoyable than we’d expected. If the Prize Disk whirs into life, Wolf Ridge can provide plenty of wintry thrills. If you curious about wolves, I suggest you try Yggdrasil Gaming’s Wolf Hunters which is highly volatile and has some great bonus features.